The department is mourning the loss of our friend, colleague, mentor and teacher Lee Ann Fujii who passed away unexpectedly on Friday March 2, 2018. Associate Professor Fujii was a vibrant and much-loved member of our community. A highly respected scholar of political violence, ethnicity and race, African politics and field methods, she spent 2016 -17 as a Fellow at the Institute for Advanced Studies in Princeton, NJ where she was working on a new book on public violence. More information will be posted here as we receive it. In the meantime, a book of condolence is available at reception (Room 3018) for anyone wishing to pay tribute. 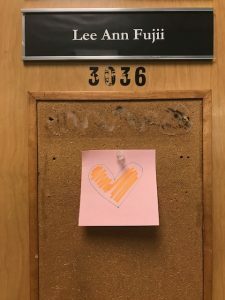 The Bulletin Brief posted a 2016 article when Lee Ann spoke to U of T News about her love of research and about teaching her senior seminar on race and violence.